We were gifted a generous amount of fresh quince so we have been enjoying many lovely recipes using this great fruit. This is a really delicious recipe that we adapted to be vegan. It is a nice side dish, or makes a good hearty lunch with a mixed salad. Clean the Brussels sprouts and cut in half. Peel the quince (we used 2), and cut into bite sized pieces. 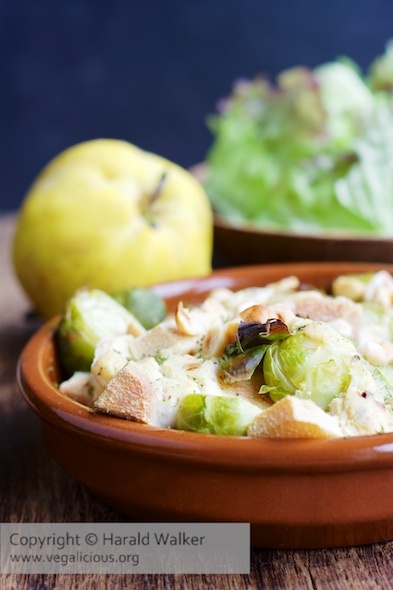 Bring a pot of lightly salted water to boil and add both the Brussels sprouts and the quince. Cook for about 5 minutes then remove from the heat and plunge into icy water. Heat the vegan margarine in a small saucepan. Remove from the heat and add the soy yogurt. Add the zest to the yogurt. Spray 1 large or 2 medium oven-proof baking dishes with oil. Mix the cornstarch with the lemon juice. Add the vegetable bouillon to the lemon juice and mix well. Add the lemon juice mixture to the soy yogurt and mix. Add the nutritional yeast, thyme, white pepper and nutmeg. Season to taste with any additional salt if needed. Cut the hazelnuts in half. Place 1-2 tablespoons of the yogurt mixture in the bottom of the baking dish). Spoon the Brussels sprout/quince mixture into the baking dish and drizzle more of the soy yogurt mixture on top. Sprinkle the chervil and hazelnut halves and place in the oven to bale for 20-25 minutes or until lightly golden brown. Posted by Chris Walker on November 12, 2014 in Brussels sprouts, Main Dishes, Quince, Side Dishes.